Peter Frohmader has been a busy boy this past year. But then again he always is. Last issue I reviewed two new and very different releases: The electro space dance Middle Eastern grooving Anubis Dance and the avant chamber symphonic Eismeer. And now Peter has pursued other interests with the latest incarnation of Nekropolis, recorded in March and April of this year. 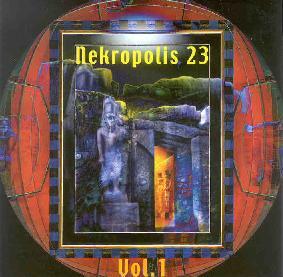 This edition of Nekropolis consists of Frohmader on 5-string and fretless bass, Holger Röder on drums, Udo Gerhards on piano, synthesizers and harmonium, and Matthias Friedrich on violin, serving up a collection of 5 lengthy excursions ranging from 13 to 21 minutes for a nearly 80 minute set of exciting instrumental progressive rock. Throughout the album Frohmader's bass is like thunder, approaching the levels of power and intensity that only a band like Magma can reach. When the band get rocking Röder is relentless on the drums. Friedrich's violin often adds a Zappa-esque and avant-prog feel to the music. Gerhards provides atmospherics and a heavy prog keyboard sound, and along with the bass a fiery jazz fusion edge at times. "Devachan" is a standout track, having a dark, gothic and overwhelmingly massive sound. I would swear there's guitar on this track... but no, it's Frohmader cranking out demonic leads on the bass. "Dusk Express" is like ELP broadcasting from the fiery depths of hell with each musician planted on his own mountain of brimstone. Fiery, fierce and HEAVY! The big epic of the album is the 21 minute "Grey Dawn Of Day". The opening segment is a quiet and slowly developing buildup that brings to mind avant-classical influences and includes the kind of Alain Rochette/Present dissonant piano style that I heard on the Eismeer album. Despite the easy-going pace and relative quiet, the music is busy and very intense, the evolving theme steadily unfolding and building up to the point where you know it's going to eventually explode... which it does!! Honestly, there is no room for a guitar player here because it would be left in the dust by the monstrous bass and ripping violin. The swirling alien keyboards reach feverish pitches that will split your brain. And the music develops in such a determined linear direction that it's hard to believe the entire album was improvised. Totally mind blowing stuff. Fans of heavy, intense instrumental prog should waste no time in checking this out. Frohmader fans will be delighted. For more information you can visit Peter Frohmader's Nekropolis Records web site at: http://www.nekropolisrecords.de.